Remembering to schedule those monthly air quality inspections and other environmental compliance checks just got a lot easier, thanks to our new planner-scheduler tool. Safety managers in charge of overseeing thousands of recurring compliance-related tasks each year can now put them in the queue just once, knowing they’ll be reminded when it’s time to complete the task again. In addition to managing environmental compliance, the tool is also a great way to keep track of maintenance schedules, project deadlines and food safety sanitation checks. But there is so much more the tool can handle, and since we launched it last year, we’ve received a number of questions from our users and those considering it. That’s why we wanted to take a moment to answer those questions here. What Types of Schedules Can I Manage? 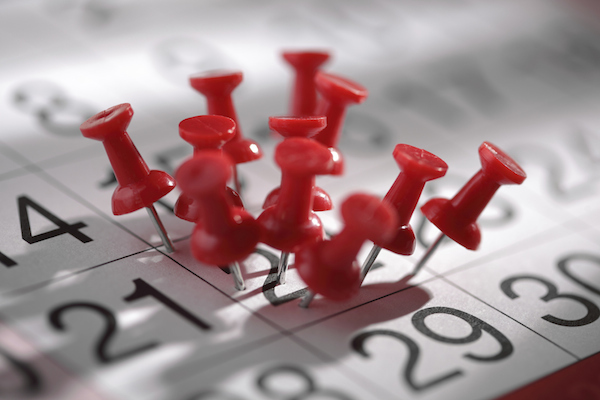 Why Do I Need A Scheduling Tool When I Have An Action Management Tool? BasicSafe’s Planner-Scheduler tool works in conjunction with our Action Management Tool, but they have two distinct functions: Our Action Management Tool produces action items similar to work orders, but each one is a stand-alone item. Many companies have so many actions occurring each year and across multiple locations, making it difficult for anyone to keep track of all of them. With the action tool, you’d need to create 365 separate action items if you have a task that occurs each day or 52 a year for tasks occurring once a week. Our planner-scheduler tool allows you to set up one action and schedule it to recur as often as you need it. The tool also allows anyone to see a complete overview of all actions being completed in a particular area. It’s like the maintenance planning system in a manufacturing plant; the action items are like work orders. How Can I Add Instructions to My Action Item? When creating a new scheduled item, click “View Inst.” in the toolbar at the top of the page to link to any existing instructions. These instructions will be specific to that scheduler, so all quality-related instructions are stored in one place and all instructions for special projects are stored in another. If you don’t find the instructions you need, simply click the red “create instructions” link at the top right corner. This will allow you to upload an existing file from your computer or link one from your BasicSafe Policies and Procedures module. The planner-scheduler tool gives administrators the flexibility to vary the access granted to each individual. Anyone who is able to log into the tool can view schedules, see individual action items and view instructions, but they won’t be able to create new items or schedules unless you grant them access to do so. This gives you full control to customize access depending on each individual’s role. How Do I Keep Track of Recurring Items? Once you create a new item, you can set it to occur only once, or as needed—daily, weekly, monthly, yearly or a custom number of weeks. For items scheduled once or as needed, users can have the notification issues up to 99 days ahead of the target start date and then receive further follow-up reminders. Standard follow-up notifications include 30 days and seven days prior to the item due date, as well as a reminder when the item is due and past due. How Can I Tell Where We Stand With A Task? The calendar in the scheduler tool is color-coded to make it easier for users to prioritize tasks. Green items are complete, red are overdue, orange are closed, blue are open, and items are gray when no action has been issued yet. What Other Tools Work With The Planner-Scheduler Tool? Currently the scheduler links only to BasicSafe’s Action Management Tool. We plan to continue developing the tool so it will seamlessly connect with other tools you’re already using in the BasicSafe suite, including the Job Safety Analyses Tool, The Training Management tool and our Lockout/Tagout tool. Stay tuned for updates on improvements to our planner-scheduler tool and other software tools, and feel free to contact us with any questions. To take a tour of the BasicSafe Planner-Scheduler tool, click here.